Add Aquavit, honey syrup, 1 mint leaf and ice in cocktail shaker. Shake and strain into glass. Garnish with mint leaf. *honey syrup; mix equal parts honey and hot water and stir until honey is dissolved, cool before using. Store unused honey syrup in refrigerator in airtight glass jar for up to 1 month. Shake aquavit, pear simple, lemon juice, strain into champagne flute. Add champagne and bitters, garnish with a lemon twist. Add ingredients to shaker, shake with ice, strain into glass with fresh ice. Garnish with a sprig of mint and grapes. In ice filled glass add aquavit, ginger puree, simple syrup,and lemon juice. Stir and top with Ginger Beer, garnish with a mint leaf. *ginger puree; 2 ½ cups cut up fresh ginger (approximately .6 pounds), 3 ounces fresh squeezed lemon juice (2-3 lemons) and 3 ounces simple syrup then blend in blender or food processor. If needed, add a little water to process. Strain. Store unused ginger puree in refrigerator in air tight jar for up to 1 month. Add ingredients to shaker, shake with ice, strain into chilled martini glass. Garnish with a twist of lemon. Pour Aquavit, Coffee Spirit and mixers into cocktail shaker with ice. Shake and strain into ice filled lowball glass. *Vanilla Simple Syrup; heat 1 cup water to boiling, stir in 1 cup sugar until dissolved. Let cool and add 1 ½ teaspoons vanilla extract. Store unused simple syrup in refrigerator in airtight glass jar for up to 2 weeks. In mixing glass add spirits and honey syrup. Fill with ice and stir swiftly for 30 seconds. Strain into ice filled old fashioned glass. *honey syrup; mix 1 part hot water to 1 ½ parts honey, stir until honey is dissolved, cool before using. Store unused honey syrup in refrigerator in airtight glass jar for up to 2 weeks. Fill lowball glass with ice add Brown Bear Aquavit and ginger beer. Garnish with a wedge of orange. Serve on the rocks. Garnish with a lemon twist. Rinse glass with orange wedge (squeeze orange wedge into glass then drain), combine Bjørkevoll’s Gamle Holiday Aquavit and other ingredients, shake, strain into glass with ice. Garnish with orange twist. If using orange oleo-saccharum add 2 drops after pouring drink into glass and then garnish with orange twist. Add Aquavit, hot cider, cranberry juice and simple syrup to mug, stir and top with orange oleo-saccharum. Garnish with orange twist. Pour aquavit into mug, add mix and water, stir well. Top with whip. Melt butter and ice cream. Blend all ingredients until smooth. Whip all ingredients together, add more aquavit if desired. Add spirits in cocktail shaker with ice. Shake and strain into a chilled coupe glass. Muddle spices in shaker, add all ingredients except hot water, shake, pour into mug, add hot water, garnish with orange slice. *ginger simple syrup; Blend in blender or food processor: 2 ½ cups cut up fresh ginger (approximately .6 pounds), 4 ounces fresh squeezed lemon juice (2-3 lemons) and 4 ounces honey simple syrup. If needed, add a little water to process. Strain. Store unused ginger puree in refrigerator in air tight jar for up to 1 month. Pour 1 ½ oz. 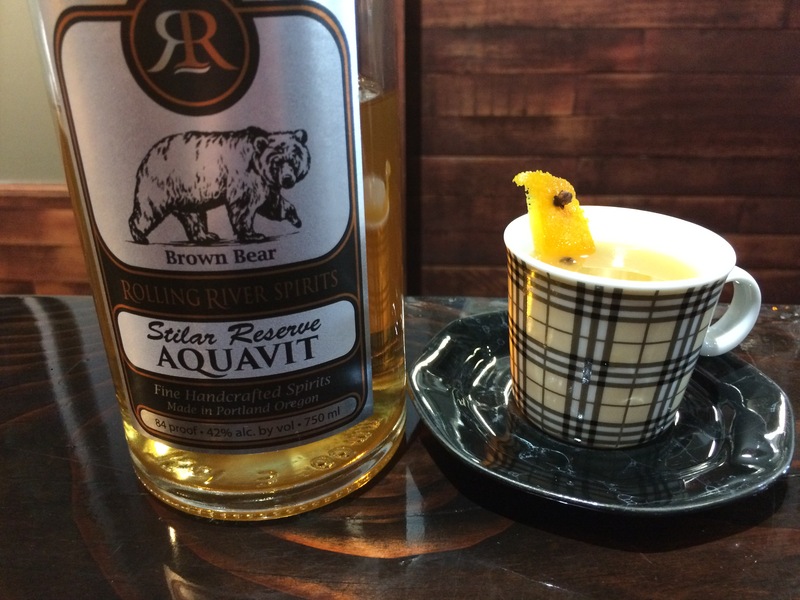 Rolling River Bjørkevoll’s Holiday Aquavit into mug and add 5 oz. hot Norwegian Wassail mix (recipe below). Garnish with small orange slice with one clove. Mix can be made 1-2 days before using, store in refrigerator. Strain (optional) the Mix into a pan or crock pot and heat to simmering. In mug add Brown Bear Aquavit, spiced honey simple syrup, orange juice and hot water. Stir and garnish with orange slice or orange peel. *spiced honey simple syrup; Muddle 12 cloves, 24 cardamom seeds (about 1/16 of a teaspoon) and 1 small cinnamon stick(about 2″). In small saucepan add muddled spices and 4 ounces orange juice, Simmer on low heat for 10 to 15 minutes. Do not boil. Remove from heat and let cool a bit. Stir in 1-2 teaspoons freshly grated or pressed ginger. Let sit for 10 minutes. Strain out spices, then add 3 ounces honey. Makes 6 ounces spiced honey simple, enough for about 6 drinks. Store extra honey simple syrup in a jar in the refrigerator for up to 2 weeks.